- some time to organize my home and clear out some clutter! - autumn harvesting and preserving! - those who visit this space...welcome, enjoy, I'm so glad you are here! I just love this. 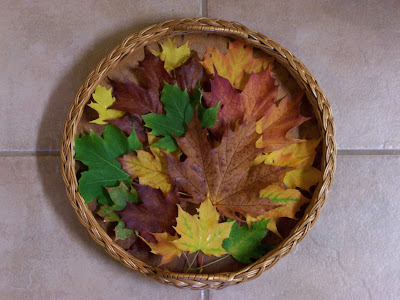 I think you should preserve it next time by pressing the leaves and then coating with Mod Podge. This is so beautiful I just hate to think of it drying up and blowing away. You could attach the leaves and make it part of your annual Solstice decor. Just sayin! Great idea Pam! I have been wanting to try coating fresh leaves with a beeswax/olive oil finish that I use on wood. I wondered if it would help preserve them, at least for season anyways! ?